Is there some kind of law that requires rental apartments to supply no more than a single square of kitchen counter space to each unit? Between the white walls, scarce and often outdated cabinets, and a lack of amenities, it’s rare to find a solid kitchen in the world of yearlong leases. But no good makeover starts with a beautiful subject, right? All you need to transform that bleak little kitchen into a well-designed, functional space is a bit of imagination, some basic home maintenance skills, and a few solid pieces. Before moving into your new space, make sure to get rid of all those things you don’t need anymore. Have you actually used that discounted bundt pan in the past year or two? If not, donate to your favorite local charity shop. Someone else might get use out of it, and you’ll be saving yourself from more clutter in your new home. 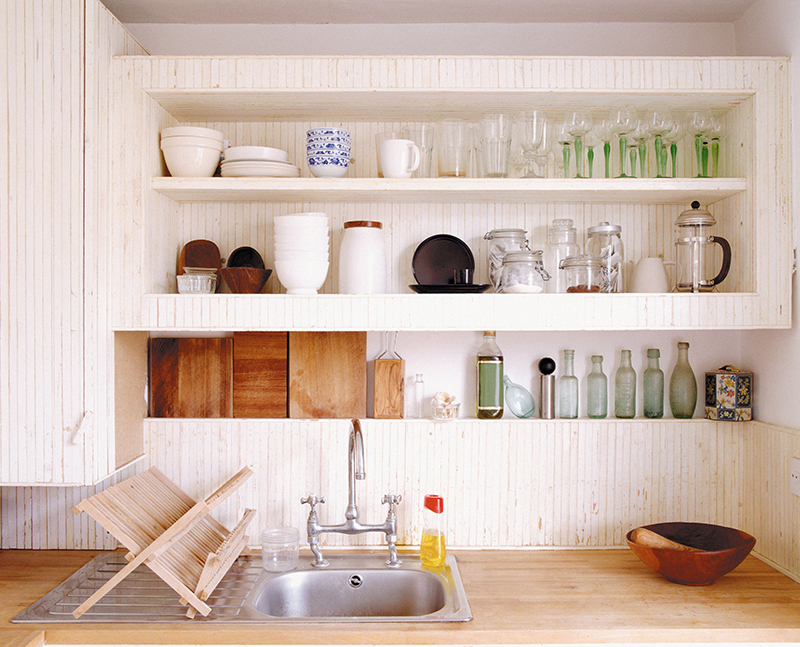 Vertical storage is a tried-and-true method of using space, and the kitchen holds some unique opportunities for making the most of it. Hanging pot racks, magnetic knife strips, mounted dish-drying racks installed above the sink, and rods with hooks for towels, aprons, small tools and oven mitts are all excellent ways to keep clutter in its place – and keep the surfaces and lower area of the room free. The ugly truth is that a lot of everyday items just make sense to keep out – but that doesn’t mean they have to be such an eyesore. Skip the plastic and get yourself a classic wooden broom, natural fiber dish brush and a glass soap dispenser. These items don’t cost much, but they add a softer look while also getting the job done. Just because your place didn’t come equipped with a dishwasher doesn’t mean you have to suffer. Installing a quality faucet with a pull-down sprayer can make your chores less of a chore (and, as long as you swap it back before you move out, it shouldn’t violate your rental agreement). Have space and the budget for something more? Portable dishwashers are a massive timesaver. From small countertop models to wheeled butcher-block-top options, there are sizes that fit into almost any space and require nothing more than your standard sink to function. A kitchen island is a versatile tool for almost any space – even the tiniest micro apartments! Whether you choose a larger center-of-the-room-style piece or a small butcher-block number, these additions create more counter space and storage, all in one piece. Another timeless tip: Good lighting is everything. 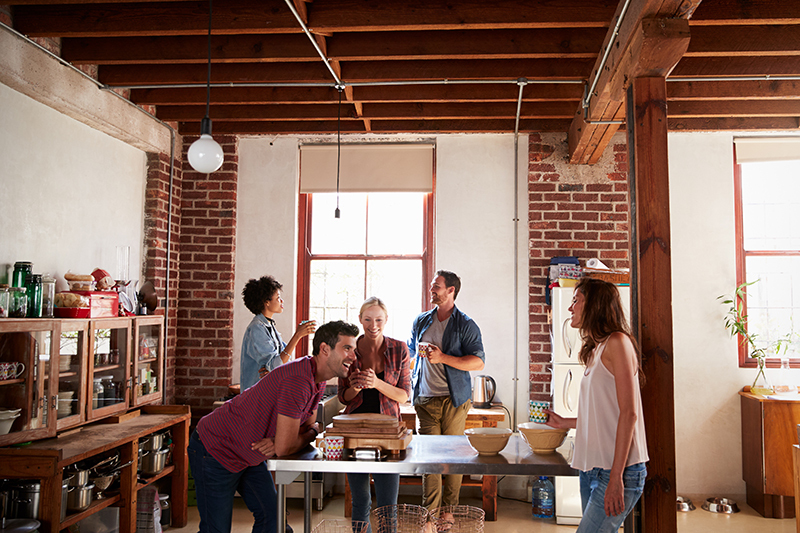 If your kitchen is dedicated to getting things done and starting your day, invest in cool lighting – the kind that washes everything in a bright, sunlit glow. A refreshing, cooler light wakes us up and creates an invigorating feeling. If you’re more of a romantic and enjoy taking your time in the kitchen, keep relaxing, warm lighting around so that you can let the day melt away as you sip your merlot. For those who prefer a bit of both, app-enabled bulbs can customize the mood for any occasion, and some even use every color of the rainbow. If there’s one common complaint about renting, it’s the stark white walls. Removable wallpaper adds a touch of personalization and won’t break the bank – or at least, it doesn’t have to. To keep costs low, stick to one accent wall. Finding a large-scale print will make the space feel larger, and layering a sizable mirror on top will maximize the look and any light. One of the best ways to keep an assortment of oddly shaped kitchen items is to dedicate either one section of the room (think: the top 12 inches of the walls) or one wall to showing them off. Whether it’s your grandmother’s antique creamer collection or the jumble of cookie cutters that won’t fit into your drawers, making them into a vignette adds a layer of personalization to your space while also providing covert storage in plain sight. 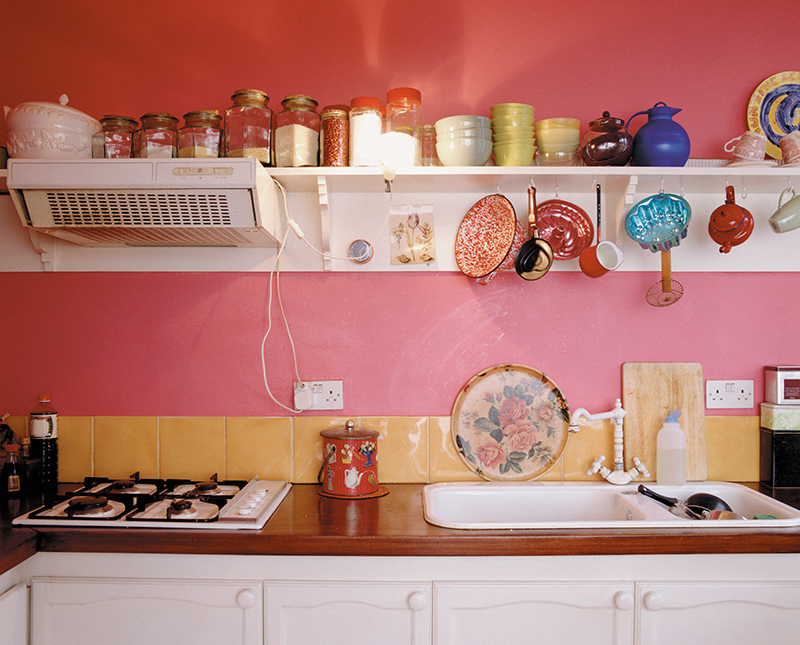 Easy-to-install hooks or some simple shelves are great ways to achieve this solution. Every room deserves a plant. Not only do they look good, but they also improve the quality of the air around them. If you don’t have the floor or counter space to spare, a hanging plant will do the trick. No natural light in your kitchen? Or perhaps you’re better at killing plants than keeping them green? No matter – there are plenty of realistic artificial plants these days, which means everyone can benefit from the organic shapes of ferns, succulents and the ever-popular fiddle-leaf figs. Have pets? Make sure to check the toxicity of your plants before choosing their placement. No matter how uniquely challenging your space might be, there are solutions waiting for you to find them.